Rajesh Setty is the popular author of the book Beyond Code: Learn To Distinguish Yourself In 9 Simple Steps and another of my absolute favorite bloggers, at Life Beyond Code. He is the president of Foresight Plus, a Silicon Valley management consulting firm that aims to give entrepreneurs a competitive advantage, as well as founder of the new online companies Suggestica and iPolipo. He has lived quite the motivated and successful life, not only as founder, president, and chairman of many companies, but also as an author, teacher, and public speaker. With such an accomplished list of entrepreneurial pursuits, I thought Rajesh would make the perfect contender for my second business interview. He has had many successes and failures, and has a lot of solid knowledge to share from that experience. I was fortunate enough to be able to meet with him in person on my recent trip to Silicon Valley, and he was kind enough to let me interview him by email. Rajesh, you are a founder, president, chairman, author, and blogger. Please tell us about the many business projects you are currently involved with. iPolipo – I am one of the founders and serve as the executive chairman. We think that people want to spend more time “meeting” people rather than “scheduling those meetings” with them. We have a solution that will help in doing just that. Suggestica – I am one of the founders and serve as the president. We think that there is a non-information overload on the web. By bringing trusted content, we not only hope to save time and money, we truly want to bring joy into people’s lives. Compassites – This is a company in India and I serve on their board. Compassites is totally focused on helping entrepreneurs with their product development needs. Their claim to fame is that they can take an idea from concept to launch in record time. Foresight Plus – This is a management consulting firm where I partner with some select businesses and individuals to bring them an unfair and sustainable competitive advantage. I am no longer accepting new clients with this business for the near future. CIGNEX – I was one of the founders and served as the CEO for the first five years. While I am no longer operationally involved in the company, I help in some business development activities when appropriate. I am involved in a few more projects but those are all in stealth mode. I am an entrepreneur at heart but I am also an author and a teacher. On the business side, I act as a catalyst to speed up multiple projects simultaneously. On the personal side, I love to help already high-performing people reach greater heights. What sort of background do you come from? And what was your experience like living and working in different countries around the globe and finally coming to reside here in California? I was born and brought up in Southern India. I come from a middle-class family. My father was a civil engineer working for the state government. That meant that we would move from one place to another place every few years. It seemed like a pain at that time but it taught us to adapt to new situations. Increased my respect for diversity: Every country was different and we had to get used to the diversity. Now, it is more fun than a problem. Enhanced my ability to adapt: Each country was also different in terms of how we live and work and basically how to get things done. Expanded my network globally: Relationships in different countries help tremendously with globalization in full force. Where did you get your formal education and what did you study? I completed my Bachelor of Engineering at Mysore University in India, in Electronics and Communication. Of course, I didn’t use much of what I studied in my engineering at my work. Do you have a word of advice for college students and other young people who would like to become successful leaders or entrepreneurs? I think every college student should try to pursue a life of leadership. If you are a college student, you can learn that by taking some initiative to do what I call “filling in the blanks.” Wherever you are, you can always find something that everyone thinks someone else will take care of–blanks–and rather than thinking that someone else will take care of it, you can take the initiative to take care of it. If you make this a habit, you would have laid a good foundation to become a leader. Are there any specific skill sets that don’t get taught in school that are invaluable in the business world? What do you recommend to get over those hurdles? Building long-term relationships: Long-term relationships can be a huge competitive advantage just because of the sheer fact that it takes a long-time to build them. Everyone knows that, but the schools don’t teach it. You have to learn it on your own initiative. Improving your likability: When I tell people that likable people have an easier time getting ahead, people usually agree. When I tell people that unlikeable people have a hard time getting things done, people agree to that too. However, when I ask them if they have done anything in the last one year to improve their likability factor, they look at me as if I am from a different world. Likability is a key skill and you have to learn it on your own. Learning how to learn: Schools teach you stuff but rarely teach you the concept of “learning how to learn.” It is your responsibility to learn the best way to learn new things. Many of your current skills won’t help you to succeed in the future. So while you are delivering your current projects with your current skill sets, you have to also learn new skills. Unlike the times when you were a student, you have less time to learn a lot more. This means you have to learn how to learn. Leveraging your time: Every one of us has only 24 hours, but successful people get more out of those 24 hours. How can you too get more out of your time? For starters, start designing your activities to yield multiple rewards. For example: you come across a very interesting service on the web, you can see who among your friends will be interested in it and why. Remember that even if only two people are interested, the reasons for their interest may be different. Your job is to send both of them a note explaining the relevance of that service to them. This is an example that you are caring for what they care about. Building your personal brand: Every person has a personal brand, whether they like it or not. It is “who they are to the world.” So, you have a personal brand too. The real question therefore is: “Is your personal brand effective?” Like likability, personal brands provide a powerful shortcut to many things. It takes a while to build a powerful personal brand and it takes a lot of effort to maintain and grow it, but the rewards are long-term and sweet. What values would you say have provided you with the greatest motivation to be continually successful? What do you care about most? If I could pick one value, it would be the ability to touch the lives of people in a positive way. I like to have a magic touch–meaning when someone is already magical (high-performing), I would like to touch them! As an entrepreneur and executive businessman, what experiences have left the most lasting impression or have been the most memorable in your work experience? It is hard to single out any one experience during the last decade, Cody. However, every time I see a smile on one or more of our clients’ faces, I feel blessed that we were able to solve a problem for them or open up a significant opportunity with our products or services. So, you’ve just unveiled your newest venture iPolipo just days ago. Please tell us all about it. We launched iPolipo in the “controlled beta” mode on Monday, December 11. We hit 90% of our beta customer count by Friday of the same week. This was an overwhelmingly positive response for something that was built over the last one year. iPolipo solves the everyday scheduling problem for business executives. It is common for two people to exchange multiple emails or voicemails to schedule one meeting. It is also frustrating to hold a particular slot on your calendar open waiting for a confirmation from the other party. iPolipo solves this problem by allowing people to share their free slots on the calendar effectively on the web. And what motivated you to start writing? Tell us about some of your written work. I started reading early. By the time I was nine, I must have read close to 700 books–mostly novels and other fiction. When I was nine, I had an idea–you can say a crazy idea–to write my own novel. At that age, you don’t have a lot of logic in your head. So I didn’t think much, but wrote a 200-page novel. My parents thought I was mentally ill, as it was odd for a 9-year old kid to write 200 pages of anything. But my craziness continued. I thought, “writing is the hard work; publishing should be easy.” I immediately took action and started searching for a publisher. Long story short, after more than a hundred rejections and four long years, I found a publisher to get my book published. After that there was no looking back, and I have thoroughly enjoyed writing since then. I have so far got seven books published. 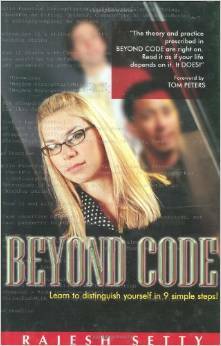 Four novels, one collection of poems, one book on mathematics and my latest book Beyond Code (with a foreword by Tom Peters) is a management book that’s focus is to help people distinguish themselves to raise above the commodity crowd. I talk about 9 things that people can do to distinguish themselves. It is available in many major bookstores and almost all online bookstores like Amazon, Barnes and Noble, and 800-CEO-READ. What kind of readers do you write your blog Life Beyond Code for? My blog is targeted at knowledge workers, entrepreneurs and ambitious students who want to get something more out of their lives. It started off as an extension to the book, but has taken a life of its own. I write on topics that range from how to get more out of your life, the art of leverage, distinguishing yourself, leadership, entrepreneurship and some occasional mini sagas (a mini saga is a story in exactly 50 words). How do you think web 2.0 technology is changing the way we do business? Is this a positive trend? Web 2.0, Software as a Service, Open Source or any other thing in and within itself cannot make a significant change. What we do with them is what is causing the change. I just received a business plan to look at where the entrepreneur had explained the business model something like this: “We have a web 2.0 application delivered as a Software as a Service model in the healthcare vertical.” I was sad because the idea should not be to create a buzzword-laden business plan. The underlying magic is the power of the business model and the power of execution. Both idea and the team are important and then comes the “how” part where web 2.0, open source and SaaS models come into play. Sometimes people tend to put the cart before the horse because of all the hype surrounding these buzzwords. Describe your vision of the future of business. How do you think things might change on an international level, and how might businesses anticipate those changes? Who do you think are 3 or 4 of the most authoritative experts in leadership, innovation, and business productivity currently, other than yourself? What one life tip would you like to leave us with, Rajesh? Focus on ROII. ROII stands for Return On Investment for an Interaction. Everyone is busy and running around to take care of many of their concerns. People say time is money, but most people really don’t mean it or at least they don’t behave as if time was money. In fact, they do something that is shocking–they treat money as if they can never get it back, and they squander time as if they can easily refill it at a gas station or something like that. In reality, we all know that time lost is gone forever and money invested in the right things will yield multiple returns. Imagine for a second that you did subscribe to the “time is money” philosophy. This would mean that when someone interacts with you, they are investing their time and that means they are investing money in you. Like any business person, they are interested in getting the right return on their investment (in this case, this happens to be time) and it is your duty to provide that return for them. If you don’t care about providing a decent ROII, you become a liability for that person. Worse, if someone else who is in the same role provides a better ROII for the same job, you have a serious competitive disadvantage. I wish to thank Rajesh so much for giving me a few hours of his time and sharing his valuable thoughts and experiences! As is fitting, he is the king of ensuring he delivers the highest return-on-investment to everyone he interacts with! Rajesh Setty currently lives in Silicon Valley with his wife Kavitha and their son Sumukh. You can learn more about him on his website Life Beyond Code, or from his book Beyond Code.